How do I create a new Team Website? 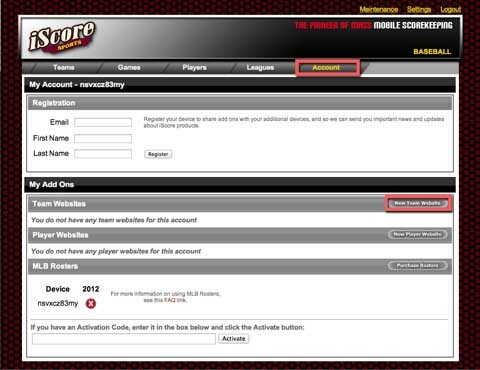 Go to the Options screen in iScore on your device and press Export, then log in to the Admin Website for you device (http://my.iscorecentral.com) You can find the information needed to log in by going to the Options screen in iScore on your device and touching the Admin Website item. If you have not yet created your team, press the "Add Team" in the Teams->Overview section to create the new team. 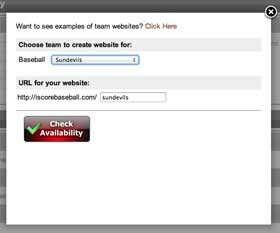 Go to the Account tab on the Admin Website, and in the Team Websites section press the "New Team Website" button. Use the dropdown to select the team for which you wish to create the Team Website. If you have multiple sports, be sure to select the team for the correct sport. Press "Check Availability". If the name you have chosen is already in use, you will have to enter a different name. When "Check Availability" succeeds, you can either pay for the Team Website immediately through PayPal or you can select the 7-day free trial offer. Selecting "Pay Now" will take you to a PayPal checkout screen where you can purchase the Team Website.